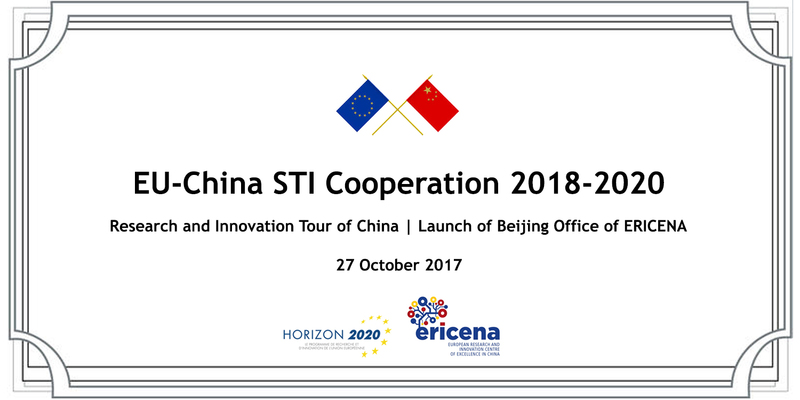 We are pleased to invite you to the upcoming event EU-China STI Cooperation 2018-2020 which will take place on October 27th (Friday), 2017 at the Embassy of Italy, Beijing. The event will consist of several consecutive sub-events organized by the European Delegation and ERICENA (www.ericena.eu) project team and supported by EURAXESS China (china.euraxess.org). The day will start with the presentation of Horizon 2020 Work Programme for 2018-2020 and the launch of the Tour of China 2017 that has been prepared by the EU Delegation in cooperation with the network of Science Counsellors from European Union Member States and Countries Associated to Horizon 2020 together with counterparts from Chinese authorities. It will then be followed by the launch ceremony of the European Network of Research and Innovation Centres and Hubs (ENRICH) in China. Funded by the Horizon 2020 project ERICENA - European Research and Innovation Centre of Excellence in ChiNA, ENRICH aims to promote European Science, Technology and Innovation (STI) interests and to reinforce the leadership of European countries in STI in China by connecting and supporting European researchers and entrepreneurs. Registration in advance needed and free of charge. 10:20 – 11:30 "Europe–A Leading Destination for Science, Technology and Innovation"